Covering The Plate: A Baseball Catcher Tells All Brad Ausmus has been called one of the best catchers in baseball. He spent 18 seasons in the big leagues, playing for teams like the Dodgers and the Padres. He details what it's like to crouch behind home plate, deal with umps and make pitching calls. Catcher Brad Ausmus (left), with the L.A. Dodgers in May 2009, is at the ready as the Colorado Rockies' Todd Helton bats during a game in Denver. Brad Ausmus has spent most of his career in a squatting position. As a major league catcher, he crouched behind home plate for roughly seven months a year while playing with the San Diego Padres, the Detroit Tigers, the Houston Astros and the Los Angeles Dodgers. How did he practice for games? Even more squats. "You do it not only during the course of the game — which is the easier part — but you do it in the bullpen, you do it in spring training, you do it doing the warm-ups, you do it prior to the game," Ausmus tells Fresh Air's Dave Davies. "At times, I've tried to total up the number of squats I've gotten into over the course of a season, and you'd have to do 150 squats a day for seven months." Sports Illustrated once called Ausmus "among the finest ever to have played [the catcher position]." His ability to block pitches at the plate and his talent for knowing the strengths and weaknesses of each pitcher he worked with kept him in the league for 18 seasons. Scouts have said his ability to understand hitters' weaknesses was unparalleled. [I'm thinking] what's the score, what inning are we in, how many outs, what's this hitter's weakness, what's this pitcher's strengths, who's on deck, who could pinch hit, who is up after the hitter on deck — and you kind of go through all of these things in an instant. And then you make a decision and put down the next signal. But his ability to analyze players and to call the right pitches couldn't help prepare his knees for the constant squatting, which took its toll. By each August, says Ausmus, his legs were exhausted. "I remember walking up the stairs one season when I had a newborn, and I'd walk halfway up the landing and I'd have to rest," he says. "There is a physical demand, mostly on your legs." It wasn't just Ausmus' legs hurting during games. Catchers routinely face balls whizzing to home plate at speeds over 100 mph. If a ball jumps and hits an unpadded body part — a clavicle bone, the wrist, underneath the thighs — it really stings. "When you get a stinger, you take a second and move on," says Ausmus. "You learn to quickly put it behind you." Catchers also must protect their throwing hand. If no one was on base, Ausmus says, he kept his right hand by his hip to protect it from a foul ball. But if there was someone on base who could possibly steal? "Then I bring my hand and lay it relaxed on the groin area of my right leg, and it just hangs there against my inner thigh, so it can block the ball in the dirt or to be ready to throw a base-stealer out," he says. "It's a precarious position. In 18 years in the major leagues, I may have gotten hit there 10 times. But I've also found that if you keep your hand relaxed, there's usually no damage." Then, of course, there are collisions at the plate. Catchers are allowed to use their bodies as a barrier between a runner on third base and home plate. Ausmus would set his feet toward third base to avoid injuries, and then wait for the ball — or the inevitable hit — near the plate. "As a base runner, if you're running toward home and the catcher is about to catch the ball or already has the ball, that's when you want to hit him," he says. "That's when you want to jostle him — just before he hits it or hit him hard enough so he drops it. That's ... the time when the contact comes into play at home plate." Ausmus (left), playing for the Houston Astros in 2006, talks with pitcher Brad Lidge on the mound during a game. Catchers aren't just responsible for blocking the plate. They also tell a pitcher what type of pitch to throw, typically through hand signals dropped between the thighs. Ausmus says he went through a mental checklist in his head before each and every play. "[I'm thinking] what's the score, what inning are we in, how many outs, what's this hitter's weakness, what's this pitcher's strengths, who's on deck, who could pinch hit, who is up after the hitter on deck — and you kind of go through all of these things in an instant," says Ausmus. "And then you make a decision and put down the next signal. [You're also thinking] how did we get this guy out last time, what pitches did he see, what pitches did we just throw — so there's about 10 to a dozen things that you go through in your mind before you put that signal down." The decisions about what pitches to call start taking place well before game time. Ausmus says he prepared graphs for his pitchers before every single series. The graphs contained information about the strengths and weaknesses of every player on the opposing team. "We would go through this stack with their stats: how often do they walk, how often do they strike out — and this all gets condensed down into a chart," he says. "You use that as your cheat sheet before the game before you're going over the lineup with the pitcher that day." During the game, Ausmus would occasionally trot to the pitcher's mound when things weren't going particularly well. He says he would structure his speech based on who was pitching and what was happening on the field. "When I left the pitchers' mound, I wanted them to feel like they could get out of [that] particular situation," he says. "I wanted that pitcher, even if he was in the worst situation possible, ... I wanted [him] to feel like, 'Hey, I have a chance to get out of this.' So my general rule was to be positive." 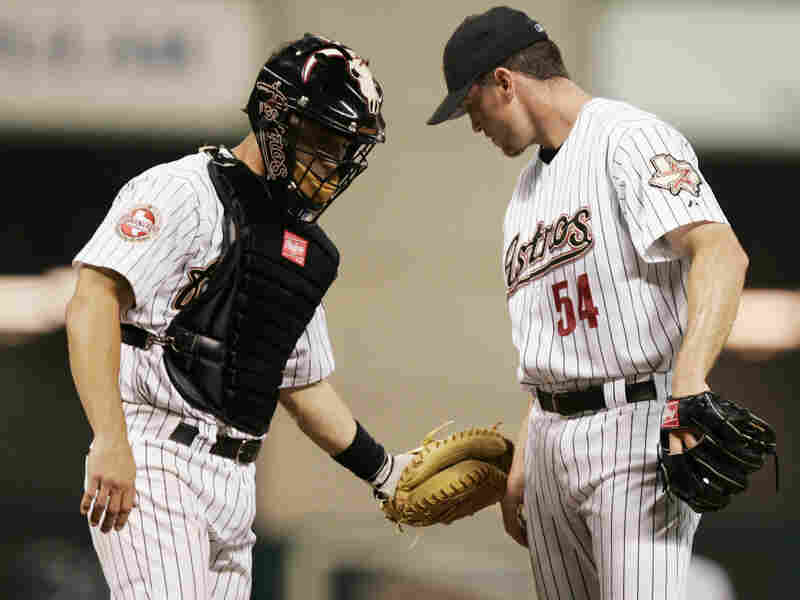 Catchers also develop a relationship with the home plate umpire, who stands directly behind them during the game. "Generally you try to accommodate the umpire — this guy's making decisions on balls and strikes, and the last thing you want to do is make him angry," says Ausmus. "And you get to know these guys. ... You have a rapport with them, and you know who you can joke around with — so there is a relationship there that goes beyond business." But umpires can make or break games with their calls. As a player, Ausmus often had close calls work in his favor because he tried to make every pitch that came across the plate resemble a strike — even if the pitch was a little outside. "My whole theory was as little movement as possible and make the ball look like its in the center of my body," he says. "So there was a slight shift in my upper body as I tried to catch the ball in the center of my chest protector in a spot where the umpire could see it." There are also times, he says, when catchers use their bodies to tell a pitcher to try to plunk a batter. "There are times where a team or a player on a particular opponent breaks the baseball code," he says. "Whether it's trying to steal a base later in the game when the opponent had a big lead and didn't need to be stealing bases and scoring more runs — trying to stick it to us — or if an opponent slides into our second basemen with cleats high and looks like he's trying to injure him, there are times where you take law into your own hands." But, if the hit was unintentional, Ausmus would try to diffuse the situation. "I'd try to explain that we weren't trying to hit him," he says. "There's no need for him to go out to the mound and have a big brawl — have people get hurt that weren't involved in the play. I would try to reason with him — and hopefully he would quietly go to first base."